Earn up to 2,872 reward points. PITCHMAP is a plug-in that allows processing the pitch of individual sounds within mixed signals in real-time. It lets you change the melodies and harmonies of any recording by simply playing your own on a MIDI keyboard or creating a pitch map using our stream-lined GUI, and optionally corrects any tuning issues at the same time. 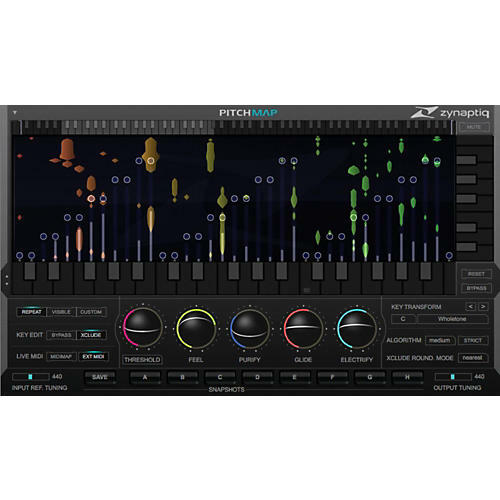 As if that weren't enough, PITCHMAP provides functions to remove or extract individual sounds from a mix, and can apply advanced synthesizer-like sound transformations to your audio. In short, it is an inspiring musical instrument; a precision corrective tool and the only processor that literally lets you shape music with your hands. Sculpt new musical ideas with PITCHMAP today. AudioUnits (AU) is a plug-in format by Apple, Inc, and is not related to Avid AudioSuite (AS), RTAS/AAX or Steinberg VST, so this plug-in will currently not work in ProTools, Cubase, Nuendo and other hosts that do not support the AudioUnits format. We will be releasing AAX and VST versions at a later point in time.